Upfront: On Clemens, Bacon, and Fleetwood Mac. Upfront is back from vacation to bring you Mark Twain, Bacon, Rumours, Jewel, MySpace, cupcakes, and the Erie Reader 2012 Downtown Debates! Rumors of a bacon shortage have been greatly exaggerated. 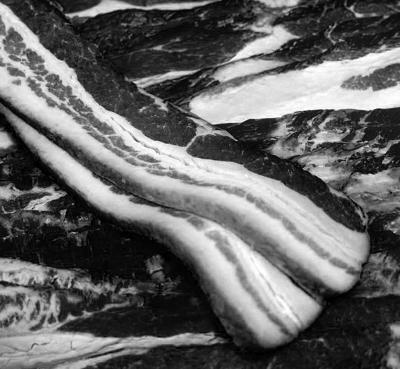 That's right; if we're talking "America" and "bacon shortage," well, never the twain shall meet; only Europe will experience the forthcoming aporkalypse, according to questionably-sourced unsubstantiated generalizations and rumors. What does this mean? This means it should probably be spelled 'rumours' like the Fleetwood Mac album. This also means we Americans can continue to eat bacon by the slab, candied on a stick, or inserted into milkshakes and pigeons. Man, that was an awesome album, that "Rumours." Oh gosh – I guess it hasn't been that hard to shift back into Upfront mode, because I've gotten completely off track before the 200th word. Sorry. That important announcement actually had nothing to do with the bacon rumours. Pork? Maybe. Mud? Probably. Let me explain. This might be second-hand news to you, but Republican Jane Earll and Democrat John Hornaman both declined to run for re-election to their state legislative seats, thus ending their distinguished careers as public servants. For now. As a result, Earll's Pennsylvania State Senate District 49 seat and Hornaman's Pennsylvania House District 3 seat are far more competitive than usual; for the first time since Jewel put out a decent album, Democrats actually have a shot at SD49 – something beyond their wildest dreams for more than a decade. Likewise, Republicans certainly have a better chance in HD3 than they did while both Hornaman and MySpace were at the zenith of their influence. With those two heavies – Jewel and MySpace – out of the way, a cadre of Democrats and Republicans smelled blood in the water. With all this in mind, we at the Erie Reader hosted a debate for each of these races during the primary election season last spring. Jason Owen and Regina Smith joined us from the HD3; John Harkins, Brian Pitzer, Terry Scutella, and Sean Wiley joined us from SD49. On Election Day, Owen and Wiley advanced, however, their victory celebrations were short-lived – as we all know, the seasons, they don't stop; spring is now fall, and Election Day is nigh. Owen and Wiley have been working hard all summer; also working hard are their opponents, Ryan Bizzarro and Janet Anderson, respectively. But working just as hard as all of them are we, your good friends at the Erie Reader. You see, we want everyone to recognize the impact that two of these four people will soon have on our city, our county, our commonwealth, and our region. We want everyone to cast an informed vote, and when it comes to acquiring the knowledge to cast that informed vote, you can go your own way, or you can follow us – to the Erie Reader 2012 Downtown Debate Series! Mark your calendars for Thursday, Oct. 11, and mark your GPS for The Jefferson Educational Society at 3207 State St., where we'll again host a debate for each of these races. Just like the Erie Reader itself, these debates are both free and open to the public. And I hear the forecast calls for a 100 percent chance of cookies, with a strong possibility of cupcakes. All four candidates have already provided written confirmation of their attendance prior to this cupcake revelation, so kudos to them; at 7 p.m., Ryan Bizzarro and Jason Owen will tell us how a lie can travel half way around the world while the truth is putting on its shoes. At 8, Janet Anderson and Sean Wiley will tell us whether it is truly better to keep your mouth shut and appear stupid than to open it and remove all doubt. So how's this all going to go down? It's pretty simple, really. The panel of questioners will consist of three people – from the Erie Reader, Managing Editor Ben Speggen and me; we'll be joined by veteran newsman Kevin MacDowell from WICU. Another experienced reporter, John Last – also from WICU – will moderate the debate. Candidates will be given a 3-minute opening statement, after which, they'll each be asked four questions; both candidates will have 90 seconds to respond to each question. And, just like last time, because we want you to play as large a role in this production as possible, one of those four questions will come from – you guessed it – you! Check our Facebook page and Twitter feeds on Monday, Oct. 8, where we'll begin asking you for questions. We'll accept submissions from that day on through the debates on the 11th. Heck, we'll even accept submissions during the debate, so if you're in attendance and don't like the way things sound or need more cupcakes, let us know. After we're through with the questions, each candidate will be given a 3-minute closing statement. And once we're through for the evening, hopefully we'll all go get a beer, have some laughs, and feel like something productive and positive took place. If you can't make it to the debates, WICU will bring them to you; although they cannot bring you cupcakes, if you tune in on Wednesday, Oct. 17, at 7 p.m., you'll see the first debate – Ryan Bizzarro and Jason Owen. On Wednesday, Oct. 24 at 7 p.m., you'll see the second – Janet Anderson and Sean Wiley. I do hope you can join us at The Jefferson Educational Society; we here at the Erie Reader have been very excited about sharing it with you, and I'm glad I could get back into the Upfront groove and be the one to do just that. And, man, that "Rumours" was an awesome album. Makes me hungry for bacon.